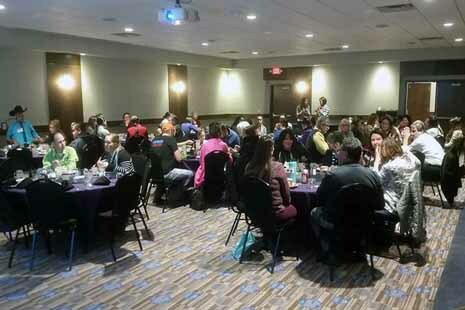 On November 13 & 14, 2017, Montana Native Vote hosted Native leaders at a two-day event, “Indigenous Movements Interchange,” at Fairmont Hot Spring Resort, along with partner organizations Western Native Voice and Indigenous Environmental Network. Discussions centered on the exploration, collaboration and strategic planning in the areas of Healthcare, Economic Development, Environment and Culture. Indigenous Movements Interchange was born out of the need to identify and bring together community leaders, traditionalists, youth advocates, program professionals, and social justice advocacy organizations that work to address and create solutions to issues that vex Montana’s Native communities and rural areas. Throughout the event, attendees participated in panel discussions, small and large breakout sessions, community conversations and networking opportunities. Event organizers envisioned this platform would provide the opportunity to create lasting friendships and professional coalitions of current and future leaders. Ultimately, attendees were able to celebrate individual and collective achievements, as well as organize for future work and collaboration. “This conference was a great collaboration of a variety of leaders to create a great streamline of ideals and to secure a brighter future for Native American people,” said youth panelist Chase Comes At Night, who is an advocate for the native and tribal issues of Montana’s native youth population. Montana Native Vote and Western Native Voice work to strengthen the Native voice through voting education, policy advocacy, and on the ground community organizing. Indigenous Environmental Network builds the capacity of Indigenous communities and tribal governments to develop sustainable communities. Through this event, these three organizations were proud to partner and provide an opportunity for leaders to come together and address inequality, social and economic disparities, and to protect the rights of Native people across Montana. To learn more about the great work being accomplished in Native communities across Montana, please visit www.westernnativevoice.org, follow Western Native Voice on Facebook and Twitter, or call (406) 869-1938. WORC will send you a notice of new blog posts. You can sign up here.